Casa Rio's is famous for several reasons. It was the first business to open its door on the Riverwalk. 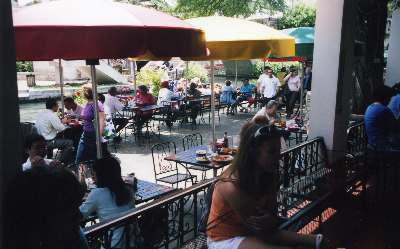 Its variety of brightly colored umbrellas have become a symbol of downtown San Antonio. 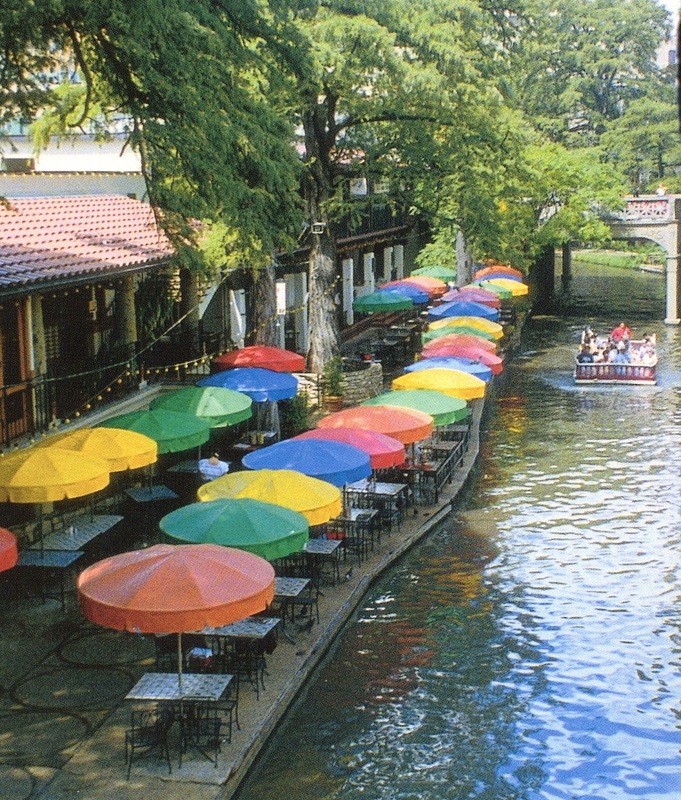 It created the idea of canoes, gondolas and paddleboats on the Riverwalk , which became water taxiis and cruise boats, and operated them until the city took them over. It has the best location downtown : at the riverwalk's key intersection, where the tributary from Rivermall joins the main river (above left), where the river crosses under Commerce Street, across the bridge from the bus depot, and just a block from the Alamo. And, oh yes, it's one of America's top five Mexican Restaurants. They don't have the cooking lessons, creative drinks or award winning dessert of their rival a mile east on Commerce Street. But in every other way Casa Rio's is a truly outstanding restaurant and you MUST eat at least one meal here while visiting San Antonio. 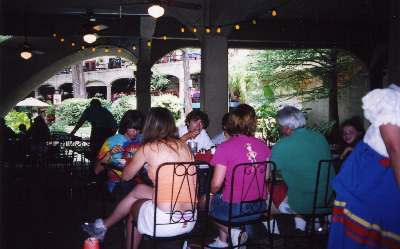 As you can see from the photos, you can enjoy a table right on the water, inside looking out over the Riverwalk, or in the shade of the Commerce Street Bridge. Or you can eat lunch or dinner on one of the 90 minute dining boat cruises. Over numerous visits and several years we've sampled everything on the menu, and it's all good. But we especially recommend the Botanas Platter (flautas, stuffed Jalapenos, Rio Pollo peppers, guacamole, sour cream and Pico de Gallo), the Tortilla Soup (Poblano peppers, chicken, spices and tortilla strips), Chili Rellenos, and their famous Casa Rio Plate (cheese enchilada, tamale, chili con carne, Mexican Rice and refried beans). The soup is a meal in itself and would make a good lunch. We consider ourselves conneisseurs of Chili Rellenos and use them as a standard by which to judge Mexican restaurants. These are among the best four we've tasted, rivalled only by Aldaco's here in San Antonio, Tivo's just west of Big Bend National Park, and The Adobe Grille in Flagstaff. The chips and salsa here are also outstanding, surpassed only by those at Tivo's. We travel with student groups, and by dinnertime we often have a few starving teenage males. Casa Rio's has the solution to that problem : The Deluxe Dinner. It contains everything the Casa Rio Plate offers, plus a beef taco, chili con queso and Guacamole salad. Order your ravenous one the Tortilla Soup as an appetizer plus the Deluxe, and we guarantee he'll waddle on back to the hotel ready to collapse, and he won't be hungry again until tomorrow evening. For normal people, however, you might caution everyone to save room for dessert. They have some outstanding choices here. In one of the great ironies of life, this nationally ranked Mexican restaurant was established and is still run by one of San Antonio's prominent German families, the Beyers. Alfred Beyers was the founder and the fourth generation is now in charge.